In this flooded forest, the family that swims together stays together... as a living raft! But plenty of predators see these floating fire ants as an easy snack. Our unlikely heroines are fire ants, a colony several hundred thousand strong. Rapacious, tenacious and industrious, they are impossible to eradicate as long as their queen is alive. But their colony faces just such a threat-the river beside it is flooding. The deluge rushes in...what else to do then, but swim! The colony floats out, as a living raft. 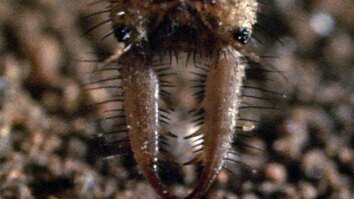 The most precious members of the colony, the larvae and the queen ant, are kept safely dry in the middle. 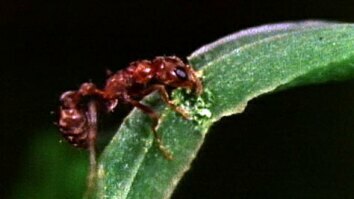 The queen ant can give birth to some three million ants over her lifetime. If they can reach dry land, they stand a good chance of rebuilding. But there is danger below. The fish pick off the ants one by one. If enough ants are pulled down, the raft will collapse and the colony will be destroyed. The ants grimly hold on, and reach the other side. They hoist the ant larvae up to dry ground, ensuring the survival of their colony for future generations. And with their survival secure, the fire ants revert to type...attacking every living thing in sight.